Rotosound is well known for their high quality guitar & bass strings, so it makes sense that the company would expand its product line to include vital accessories such as guitar cables. 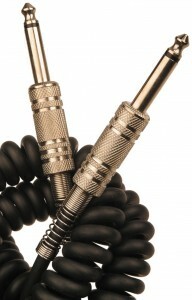 While Rotosound’s curly cable series certainly looks nice, its overall quality leaves something to be desired. Given the superior quality & tone of their bass strings, which I have sworn by for a number of years, I was quite surprised at this cable’s shoddy build quality. This cable can stand up to the sort of minimal abuse that a bedroom guitarist can inflict, but I wouldn’t rely on one for any sort of gig. When it does work, the Rotosound cable is quite nice, but it tends to break far more easily than most of the other cables in the same price range. On the outside, the Rotosound curly cables look fantastic. Unscrew the metal connectors, however, and you’ll see some very shoddy soldering. The cable’s connections are incredibly unstable, which is surprising considering the quality of the rest of Rotosound’s product line. Just a few days of moderate use can be enough to break the cable’s solder joints. If you’re handy with a soldering iron, the problem is quite easy to fix, but I would think that a professionally built guitar cable should have better quality control measures in place. The springs on the ends of the connectors are a nice touch, but they do little to prevent the solder joints from falling apart during normal use. The cable is simply too unreliable for live use, but you could probably get away with using it in a studio setting as long as you don’t have to unplug it too often. In addition, several users have reported that the cables sometimes come with faulty 1/8″ plugs, which don’t fit right in the input jacks and, in some cases, have even damaged the sockets on guitars & amps. 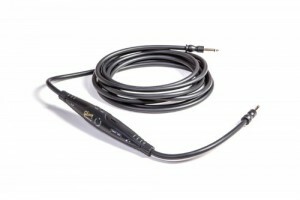 Rotosound’s curly cables are available with both straight and L-type connectors, or a combination of both. Unfortunately, the connectors seem to be a major weak point in the cable’s design for reasons mentioned previously. The cables are available with either molded plugs(which make the wiring inaccessible should a connection break), or with removable metal connectors. The cable itself is quite useful and reliable, but the shoddy soldering on the connectors means that, at some point, you will need to re-solder the connections. From a sound perspective, it works great. There’s no noticeable volume drop, no more hum & buzz than any other cable in the same price range, and the curly design allows for a lot of extra flexibility as well as keeps the cable out of your way as the effective length is always minimized. Unfortunately, a gigging musician dishes out a little too much abuse to be able to enjoy the benefits of these cables considering their shortcomings. Questionable connectors aside, the cable itself works alright. Given the low price, you could easily replace the connectors and still end up spending less than you would on, say, a comparable straight cable from Fender. All in all, these cables are a miss for Rotosound due to quality control issues. While the problems are easy to fix, even for an amateur with minimal soldering experience, it’s still a major drawback that most people will not want to endure. In my experience, Rotosound’s curly cables are pretty much bound to break at some point during regular live use, and if that happens you will be out of luck unless you have a backup handy. It’ll work in a pinch, but you should look elsewhere if you’re looking for a cable that will last you more than a few weeks for certain without additional maintenance.